One of the most important activities engineering and maintenance managers can perform to protect institutional and commercial facilities is to perform a regular, thorough inspection of their facilities’ roofing systems. Scheduling regular inspections and performing their identified maintenance often is the difference between roofs that meet or exceed their rated service lives and those that fail prematurely. But the benefits of roof inspections do not end there. Inspection programs also can reduce the need for emergency repairs, limit the damage to the structure and interior, and reduce the risk of an unhealthy working environment for occupants. In most cases, workers should inspect roofs twice each year, in fall and spring, and both inspections are important. The fall inspection helps identify defects that might have developed during the summer when roofing components undergo high thermal stresses and exposure to ultraviolet (UV) light. Similarly, the spring inspection is designed to identify defects caused by ice and snow accumulation or thermal shrinkage from low temperatures. Workers should perform additional inspections following heavy storms or high winds. 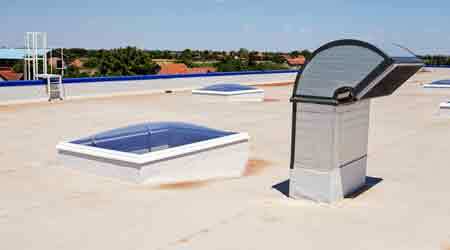 The details of the roof inspection program vary with the type of roof and its exposure. Roofs with high levels of foot traffic or concentrations of mechanical equipment require inspectors to more closely look for physical damage to the membrane. Built-up roofs have different inspection requirements than a single-ply, metal, or vegetative roof. Despite the differences, common trouble spots can develop in practically any type of roof. One of the most common causes of roof problems is a clogged or restricted drainage system. Debris, such as leaves and construction materials, can build up in or around roof drains. Restricting the flow of water from the roof can cause ponding or water or allow water to back up under the roof’s protective membrane. Inspectors should regularly clear all roof drains and keep the roof free of debris that could eventually make its way into drains. Another common cause of problems is ponding water on the roof. Prolonged exposure to water can accelerate the breakdown of some roofing materials. The weight of the water standing on the roof also can compress the roof’s insulation, increasing the depth and width of the ponding, and causing even more ponding water. Workers should fully drain rooftop water within 24-48 hours of the end of rainfall. They also should closely inspect susceptible areas for proper attachment, such as sheet metal coping, gravel stops, flashings, and counter flashings, which can allow water to get behind the roof’s membrane. Inspections also should include a check of building exhaust systems, which often vent through a building’s roof and directly on the roof surface. Depending on the interior operation the exhaust system serves, these fumes can cause significant damage to the roof membrane if they come in direct contact with it.